I developed this recipe yesterday as my wife and I planned our meals for the week. Typically, Carissa will tell me the type of dish she wants and I come up with the recipe in my head to put my own spin on it. It’s a pretty good system that usually works out well. Not to say that recipe I develop is perfect and tasty – I have had my share of misses, but this weekend ritual of ours has taken an otherwise mundane task and turned it into something I look forward to on a weekly basis. I cooked the chicken low and slow on my charcoal grill to achieve a delicious smoky flavor that perfectly cuts through the sweet, creamy and tangy barbeque ranch dressing. This salad turned out to be the perfect, light summer dish. 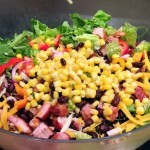 Give this recipe a try the next time you’re looking for something on the grill other than burgers, dogs and brats. Mix salt, cumin, sugar, garlic powder, chili powder, Old Bay, cayenne and black pepper together in a small bowl. Rub spice mixture evenly onto chicken thighs. Set-up grill for indirect grilling. Place chicken and corn on the grill. Grill the corn for 15 minutes and then remove and let cool. Grill the chicken for 25 – 30 minutes until cooked throughout. Remove chicken from grill and let rest, loosely covered with foil. Stand corn up on cutting board and remove the kernels from the cob by running your knife down the length of the cob. 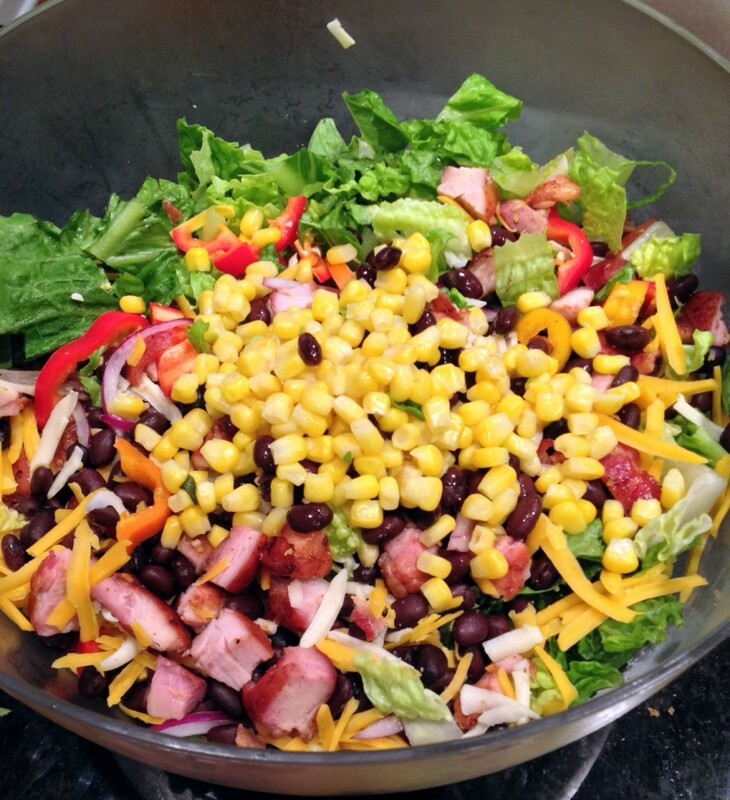 Toss lettuce, bell peppers, black beans, cheese, onion and corn together in a large bowl. Set aside. Place vegetable oil in a small frying pan over medium heat. When the oil gets to 350 degrees, add tortillas strips. Fry until golden brown, about 5 – 7 minutes. Remove from the oil, place on a paper towel and season immediately with a good pinch of kosher salt. In a bowl, whisk together ranch dressing, barbeque sauce and vinegar. Dice chicken and add to salad. 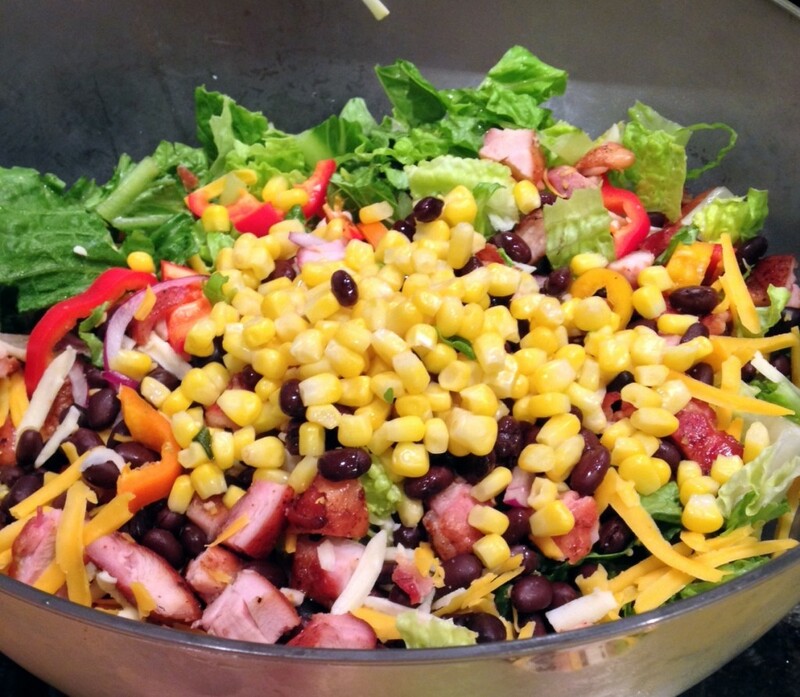 Toss salad with dressing and then garnish with tortilla strips.